It is a cruel twist of fate that inspires Spider-Man to use his powers responsibly. It is the split-second thoughtless decision of a disgruntled high-school student that shaped the hero Peter Parker would become in the stories following Amazing Fantasy #15. Why didn’t Peter stop the hoodlum who escaped past him just moments after the teen-wonder stunned television audiences, performing as the wall-crawling, web-slinging Spider-Man? In a few days Peter Parker goes from being a ridiculed teenager with no friends to a celebrity on the precipice of superstardom. For the first time in his life Peter experiences the respect and adoration that has come so easily to the likes of his fellow classmate Flash Thompson. Peter is as filled with the buzz of what celebrity might bring as he is with the resentment he has over the treatment by his peers. When a criminal runs past him in a hallway, Peter, still dressed as Spider-Man, allows the man to escape and to eventually fulfill one of the cruelest twists of fate in comics. Like the Fantastic Four and the Hulk, the hero’s contemporaries, Spider-Man’s origin is inspired by the Atomic Age in which the story was originally published. Peter is an honor student at Midtown High who is more interested in “experiments in radio-activity” than cruising the streets with his classmates. 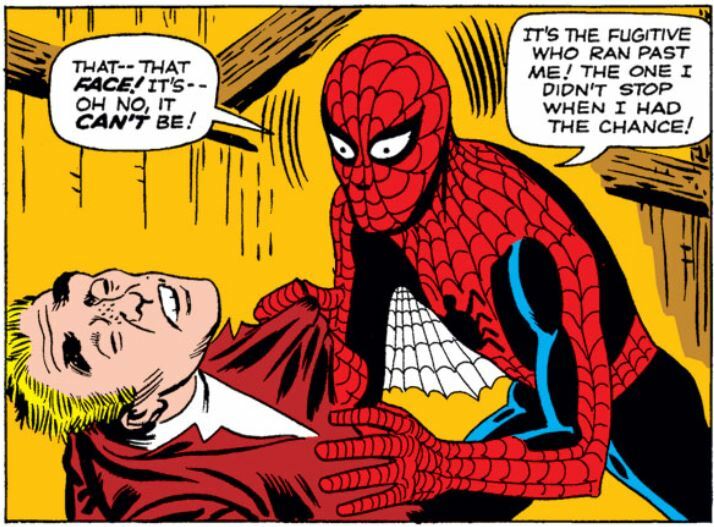 While at a demonstration of the control of radioactive rays, Peter is bitten by an irradiated spider that passes on incredible powers. The eleven-page story moves quickly as Peter decides to test these new powers in a wrestling ring with the bald behemoth Crusher Hogan. Three minutes later, and one hundred dollars richer, Peter is being courted by a talent agent who promises fame and riches to the boy. Peter puts together a costume and develops a pair of web-shooters (remember, he’s an honor student) to add some flair to his gimmick. Spider-Man’s quick rise to fame opens the story’s second act. He hangs! He crawls! He swings! Every stunt in his arsenal captivates audiences whose appetite for the wall-crawler has him taking offers for a new television series and accepting show-biz awards (if you believe what’s being printed about him in the local papers). It’s at that moment, when everything is going Peter’s way, that he allows the escape of the criminal who ultimately murders his Uncle Ben. Peter’s devastation turns to rage as soon as he learns that his uncle’s murderer is holed up in an abandoned warehouse across town. Peter dons his costume and swings to the hideout where Spider-Man is able to take the murderer out with little effort. Halfway down the story’s final page, Peter learns a shattering lesson in power and responsibility. He could have prevented the murder of Uncle Ben. The surprise twist of writer Stan Lee and artist Steve Ditko’s story is haunting and, like the murder of Bruce Wayne’s parents, creates a believable turning point in Peter’s life. There’s no question that he would he would become a costumed vigilante, risking his own hide time and again. Not only does he not want anyone to experience what he has gone through, but he also knows that he has the abilities to prevent similar tragedies. 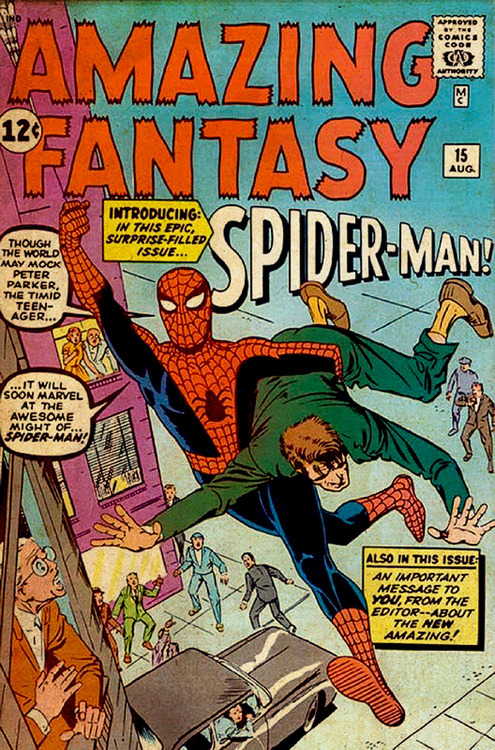 Because “Amazing Fantasy” was known for surprise endings, it’s interesting to contemplate what impact there would have been if Spider-Man’s origin did not include so impactful a twist. Uncle Ben is more a plot device than he is the source of Peter’s moral compass, as the character would become in the decades of stories to follow. Both Ben and May Parker have little to do but shower their nephew with the adulation that his classmates never do. The couple do not provide Peter with insightful guidance, there are no discussions of right and wrong, nor the importance of great power and so forth. That last iconic bit of wisdom comes in the form of Lee’s omniscient narrating in the final panel as Peter realizes that he’s going to have to atone for his mistake. Steve Ditko’s original cover art for “Amazing Fantasy” #15. Amazing Fantasy #15 presents Peter Parker as an awkward teenager and not the everyman hero whose ongoing problems remind readers that superheroics don’t wash away the constant challenges that keep our lives interesting. Spider-Man would also not be known for his wise-cracking until a few issues into his own run of The Amazing Spider-Man (which debuted in March of 1963). Ditko’s comfort with drawing Spider-Man would not come until a few issues into his run on Amazing. Some of the figures in this issue are clumsy and the webs on his costume look as though they were a nuisance to the artist. There are panels in the story where Spider-Man also appears more portly than the svelte Peter Parker. However, Ditko captured perfectly what was amazing about Spider-Man’s abilities. He scales walls on his toes and fingertips, he leaps high over assailants, and he shoots webs to swing across the city. Ditko realized the wonder of the character in Lee’s story and created images that resonated with readers. Jack Kirby’s iconic cover displays a more heroic depiction of the web-slinger than Ditko’s version. But it is Ditko’s Spider-Man, somewhat gangly with a less nuanced suit, that is more befitting the character that Lee and Ditko would present to readers. Kirby’s cover was similar to one illustrated by Ditko, but Lee requested that his frequent collaborator take a swing at it and Ditko completed the inking. Much of where Lee and Ditko would take the Spider-Man is a believable extension of what the two creators established in Amazing Fantasy #15. Most significant being that Peter Parker is as average a Joe as characters in comics came. Spider-Man’s peers were brilliant physicists, war heroes and billionaire playboys. Peter, a teenager uncomfortable in his own skin, could not be farther removed from the circles to which these men belonged. Being an outsider is just one of the characteristics of Spider-Man with which readers could relate. Spider-Man’s origin is defined by a terrible choice to not act when he had the capacity to do so. After fifty years of hanging, crawling and swinging, his mission to protect remains as earnest and heartfelt as it did when he first realized that with great power comes great responsibility. I love this “Fantastic Firsts” series, and really think you nailed a wonderful article about one of the most legendary origins in comics. Where it could have been ‘old hat’ I feel you brought some new insight to this, and it really shines with your love for the comics. Awesome article! Thanks for reading! I’ll be doing an article on the JLA next, which I’ll try to get out in the next week or two. Oooh, I’ll be back for that one! Read the Wolvie one, as well – another great look at a major moment in comics. These are all really well thought out looks at these classics, I love it! Much appreciated! I’m having a great time writing them!